Garment Bags for Dance Costumes by Closet Trolley! 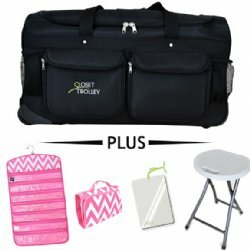 Closet Trolley's Rolling Duffel Competition Dance Bag With Rack, Great for Dancers! 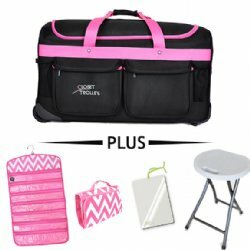 The Closet Trolley rolling duffel dance bag with rack is the perfect rolling duffel with clothes rack for today's dancer on the go. A compact and sturdy duffel that also features telescoping support bars with a crossbar that functions as a clothing rack. This bag is a superb way to transport your clothes or dance costumes anywhere in the world you need to be. Whether you're a traveling business person dealing with all the hustle and bustle of international airports, or a busy mom with kids who dance, this duffel is the perfect bag for you! In addition to the collapsible clothes rack that can be installed in mere moments, the Closet Trolley duffel constructed of 1680D nylon, features heavy-duty zippers and a telescoping handle that fully recesses into the bag. Other features include, two zippered pockets, two mesh pockets (ideal for holding water bottles) and a folding pocket just the right size to contain Closet Trolley's folding stool - and those are just the exterior features! Inside are several mesh pockets and "D" rings to organize all your belongings. Fully assembled, the clothing rack is an exceptional 57 inches tall; large enough to hold all your clothes, but not so large as to be inconvenient to take with you anywhere. This would make a great dance competition bag, or even just a routine dance bag! And at less than $200 per bag (or lower!!!) and a flat shipping cost of $24.95, this bag is a terrific deal...simply the best value out there! When it comes to organization, convenience, and durability, this wonderful self-contained garment bag has it all!